When my parents returned from their trip to Alaska a few years ago, I was as green with envy as Alaska is green with trees. The main cause of this bout of travel jealousy? 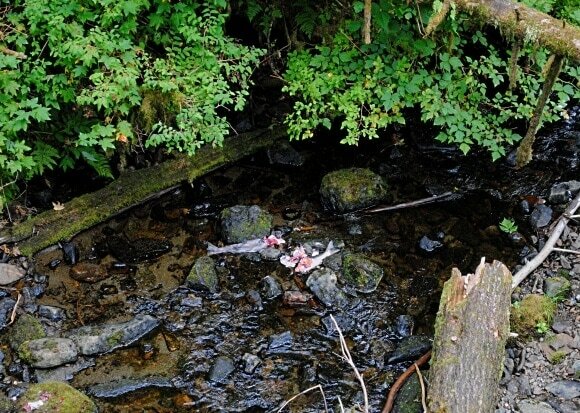 Their photos of wild bears scooping up spawning salmon from a rushing river. These photos became the catalyst for my family’s Alaskan Celebrity Cruise. I just had to go see those bears! 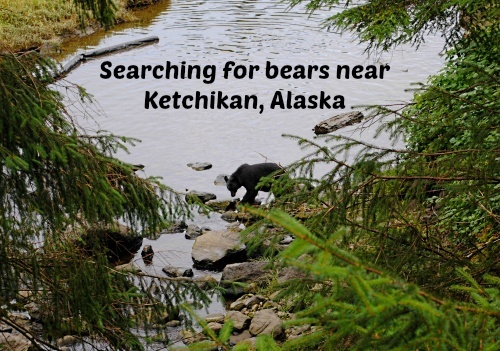 Here’s where to find bears near Ketchikan, Alaska. In Ketchikan there were several bear-focused excursion options. We chose one of the most economical, the Bear Country & Wildlife Expedition. Kids must be 12+ to tag along on this excursion, which is all for the best since it involves a lot of standing around not doing much and being fairly quiet…two things my children aren’t very good at. 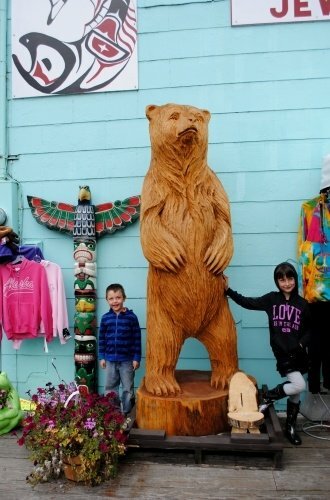 Instead, my husband and I walked through Ketchikan’s small downtown with our two kids (ages 5 and 8) before we checked them into our ship’s youth program for the afternoon so we could be free to commune with the bears. After a half-hour bus drive, we arrived at Herring Cove, where we were met by an enthusiastic and knowledgeable guide named John. After some brief safety instructions, we bounded into the woods thrilled at the prospect of witnessing throngs of black bears scooping up lunch from a stream. John led our small group of bear seekers through a 1-mile stretch of a 64-acre rainforest sanctuary, teaching us about bears and other animals along the way. 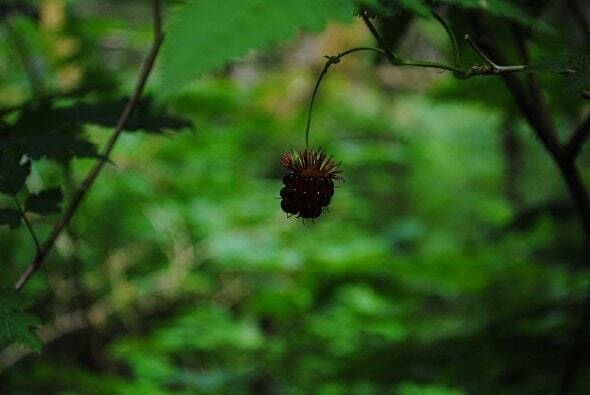 The sanctuary is just one portion of the 17 million-acre Tongass National Forest, the world’s second largest rainforest. Between four to six bears make the sanctuary their home. We traversed the first of a series of suspension bridges and then stood atop a platform for several minutes. My husband and I, along with a dozen or so other bear seekers, stood staring at the trees. “Look for any movement,” our trusty guide told us. John did his best to keep us all entertained with stories about bears seen on past treks, like the time a woman stood gaping at him, mouth wide open and pointing. He turned around to find a bear directly behind him, which led to John’s involuntary and extraordinary leap and scream that startled the bear into retreat. We learned a whole lot about black bears that day. Did you know that they have animal medicinal awareness? 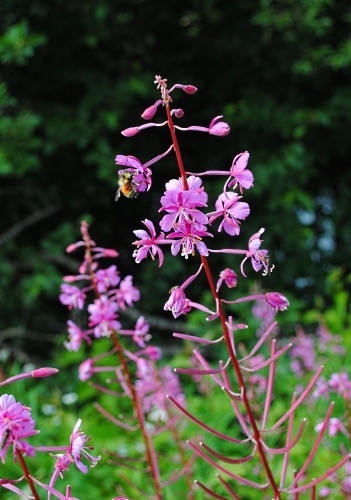 They instinctively know which plants to eat to ease ailments of all sorts. For example, black bears eat artist conch, a fungus that causes constipation to keep from “wetting their beds” during hibernation. When they wake from their long winter naps they eat skunk cabbage to get things moving again. Eventually we traversed onward to another platform where we stood and stared into the woods some more. John pointed out adolescent bald eagles in the treetops (lacking in their telltale white heads due to their youth). 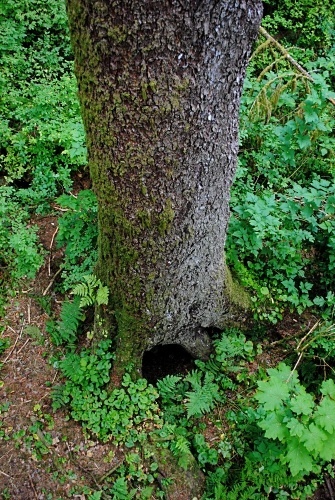 We also saw a bear’s hibernation den formed in the trunk of a tree. 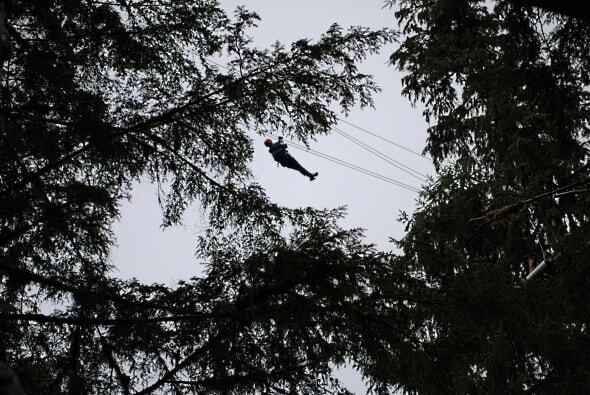 Above us we heard the whir of zip-liners as they soared over our heads. “Why didn’t you sign us up for the zip-lining?” my husband asked. Nearly two hours into our bear excursion, there were no bears to be seen. There was grumbling among the ranks when our guide received notice from another naturalist further up the trail…a bear was headed our way. We hurried to the next platform and within a couple of minutes a black bear came lumbering along and strolled past on the path below us. One of the loudest grumblers said, “You just lucked out, John. If we didn’t see a bear, I think your goose wouldda been cooked, my friend.” Bear sightings occur on about half of all tours and are not guaranteed. Our bear seen, we moved on to a few tour extras. We started with a brief visit of an abandoned sawmill. 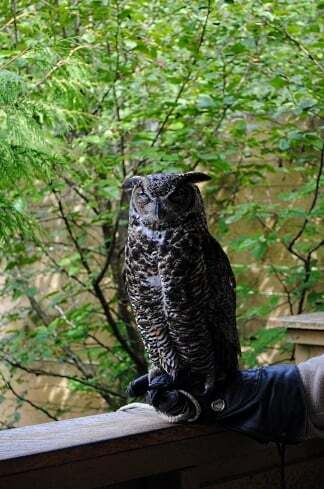 The Alaska Raptor Center has mini outpost here, with a rescued owl and bald eagle. (The main facility in Sitka, Alaska houses 20 rescued birds.) These birds were injured as adults and therefore can’t be reintroduced to the wild so they live here as educational animals. Both are apex predators, meaning they are at the top of their food chain. The handler wore a sturdy glove lest her hand be crushed by their powerful claws. We met five female reindeer that were rescued from a local sausage farm. John said that a bear came by the reindeer enclosure once but was driven off by the herd. The bears never returned. 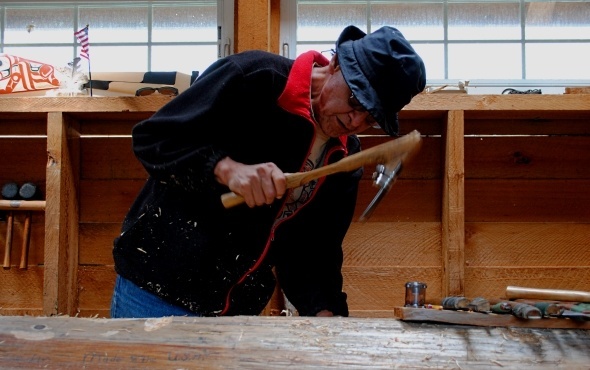 Wayne the totem carver gave us a brief demonstration of his tools and methods for carving trees into sculptures in the traditional method. After a short stint in the gift shop, where complimentary cookies and coffee were offered, we hopped back onto our bus for the ride back to the cruise ship. The Alaska Bear Adventure sounds very similar to our Bear Country & Wildlife Expedition but the destination is reached via float plane rather than by bus. The Neets Bay Bear Cruise includes a high-speed boat cruise to Neets Bay to search streams and beaches near a salmon hatchery for bears. There were a few other bear-viewing options, all of which took place at Herring Cove (where we went) and Neets Bay. If you want to witness bears aplenty deftly scooping salmon from rapids, you may want to head to Brooks Camp at Katmai National Park. 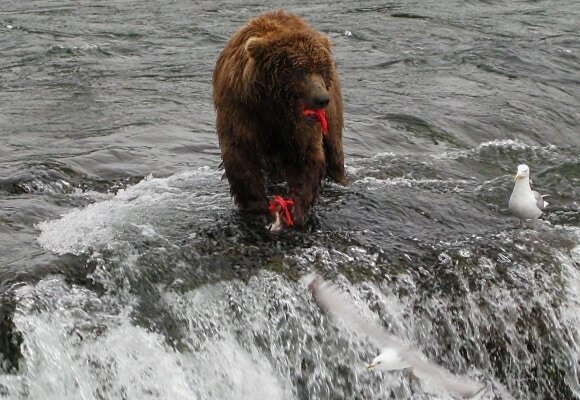 The bears at Katmai are brown bears (a.k.a. 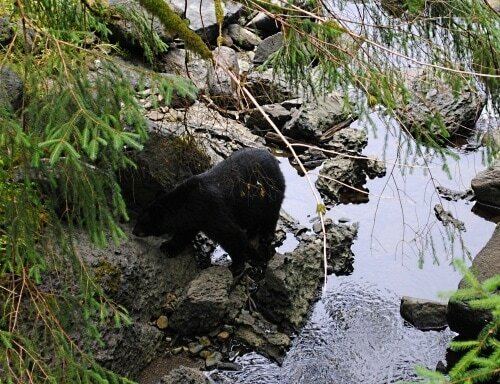 grizzly bears) whereas those near Ketchikan are the smaller and less aggressive black bears. Am I glad I saw a wild bear in Alaska? Yes! Knowing what I know now, would I sign up for this excursion again? Probably not. Despite the gorgeous forest setting and educational tour, I would have preferred a faster-moving excursion. Instead, I might opt the Rainforest Canopy & Zipline Expedition. 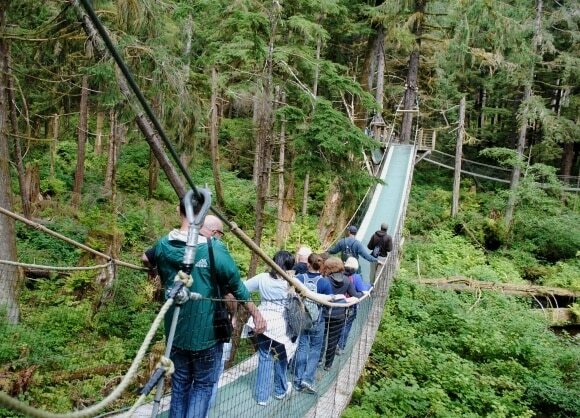 From the sound of squeals and cheers coming from the trees above us, it sounded like an exhilarating way to experience the Tongass Rainforest. If you are visiting Alaska with kids and looking for a family friendly excursion, I’d probably choose the Wilderness Exploration & Crab Feast for a boat ride through the Inside Passage to remote crab fishing grounds where tour-goers can help retrieve crab pots from the water. Then families are rewarded for their efforts with a Dungeness crab feast at the George Inlet Lodge. Have you seen bears in the wild? Where? Let us know in the comments below! A Note from The Travel Mama: Celebrity Cruise Line hosted my family during our 7-night Alaskan Cruise aboard Solstice. We paid for all of the shore excursions ourselves. All opinions are mine, as always. We were a bit disappointed that we didn’t see any bears on our Alaskan cruise and a few days after returning we were visiting grandparents on Manitoulin Island when a black bear crossed the road in front of us – the kids were thrilled! We saw a lot of bears growing up in rural Northern Ontario but it never ceases to be exciting to see one – from a safe distance! 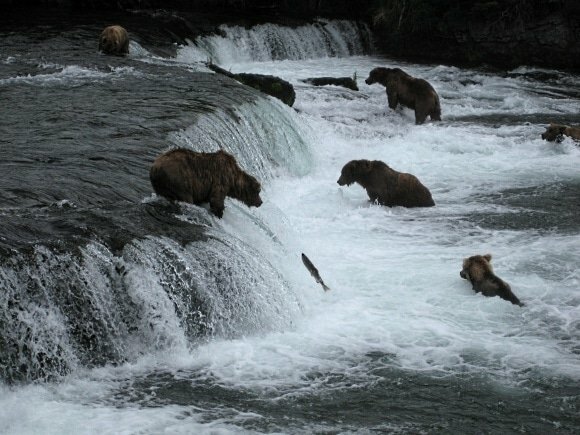 We were in Alaska at the end of July and we were told that the likelihood of seeing the grizzlies going after the salmon was determined by when the salmon were spawning. We considered ourselves lucky to see them because it was near the end of this period. We watched them for an hour since we were the last group to get to the lookout stand due to the delay crossing the bridge with the bears. Most groups were allowed 30 minutes. What an incredible experience! I want to go back to explore more of Alaska and see more bears! We only scratched the surface of this huge, beautiful state. We did and adventures by disney land tour in alaska and saw bears twice. Once in Denali and another one swimming in the waters of the kenai fjords. The jokes were endless. Why did the bear cross the fjord? etc. Even the boat captain was in shock. He’d never seen that happen before. The bear was a mile from land. He was a good swimmer. Too cool. How cool, Precia! I hope the bear made it back to land safely, though. So glad you got to see an Alaskan bear! We spent an amazing day with brown bears on a river just off of Geographic Harbor in Katmai National Park. Took a float plane in from Homer on a guided tour. We sat less than 50 yards away from these mighty giants. One of the highlights of my travels thus far. Debi – I really want to return to Alaska to explore more of this magnificent state…and to see those bears at Katmai! I am so glad that you spotted a bear! We have had terrible luck with wildlife excursions. On our last cruise we booked a whale watching excursion where whales are spotted 90% of the time, and saw nothing at all. I am always glad for those extra features so the excursion isn’t a total loss. Allison – Oh no! I hope you saw some dolphins or seals or interesting birds at least! VERY cool!! i love that your guide was so knowledgeable and humorous. it helps! So true, wanderingeds! John was such a great guide and made learning easy and fun! I’m going to have to do this one of these days. I love bears. Like really love them. Katie – It’s pretty awesome to see a bear in the wild. I hope to get back to Alaska some day and get to Katmai to see those grizzlies! It’s really cool to see bears in real life! If anyone is interested in fishing, we’re here to assist you. Our charter business, Alaska Ocean Pros specializes in long range Homer Halibut fishing trips (Halibut, Rockfish, Ling Cod and Salmon). Book your Homer Halibut Fishing trip before January 2017 and receive $25.00 off per person.